This is another fabulous library find - "The alphabet tree" by Leo Lionni. An oldie - published in 1968 - but a goodie. 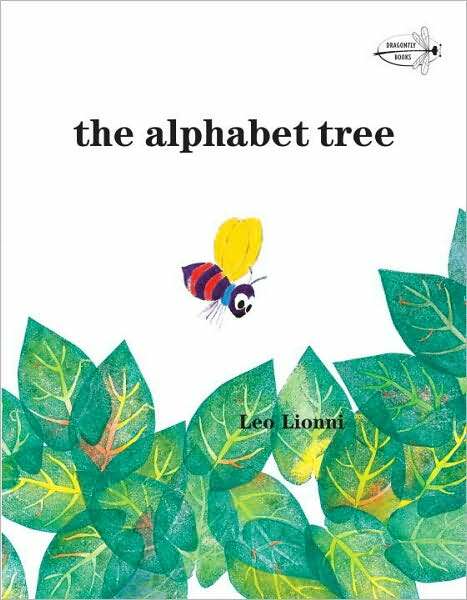 The alphabet tree is full of letters, living a happy life, hopping from leaf to leaf on the highest twigs. However, when the wind blows, some letters are blown away and the remaining letters are frightened. Luckily, the word-bug visits and explains that if the letters stick together and form words, they will be strong enough to resist the wind's force. He is right, and the letters, or words, are safe. A wandering caterpillar sees the words and is confused by their apparent randomness. "Why don't you get together and make sentences - and mean something?" The caterpillar is pleased with the sentences formed by the letters but encourages them further. "You must say something important." said the caterpillar. Their message - I won't spoil it for you! - is one that is still relevant today. I love the gentle teaching philosophy behind this book, the slow beginning of understanding letters, then words, then sentences, all building up to the importance of communication and making your words count. This book lends itself beautifully to teaching the alphabet, as well as all the wonderful artwork it could inspire. So we just had to make our own alphabet tree! And after creating our small version, I've decided that when Annalise is ready to learn the alphabet, I am going to make a huge, moveable one that will not only inspire her learning but be a thing of beauty and joy! Stay tuned, my friends! Meanwhile, to make our small tree, I painted a cheap canvas with a blue sky and brown earth and added a tree. Then I used a white wax crayon on watercolour paper to draw tiny leaf veins, painted over them with green paint in rough leaf shapes and cut them out. (Note the use of "I" - we were going to do it together but then the kids' distraction grew in direct correlation to my focus!). However, Annalise was back at my side to help stamp the letters. She stamped random letters on the leaves but contributed the word 'peace' to our ideas. We used a spray adhesive to attach the leaves, and added the word-bug and caterpillar as well. Here's hoping the letters on our alphabet tree live a happy life too! Hi Karen, you seem to find the most lovely children's books. I've spent the past half hour looking through your site and loving it! Thank you for your reviews and arty inspiration. PS. Where did you find these sweet stamps? Thanks for all your kind comments, Kylie! Yes, Monkey Magoo is made from linen - lovely and textured. The stamps are from a Melb. shop Zetta Florence - expensive but I think we'll all use them for years of art projects.